Tagged under Nobuyuki Anzai, Studio Pierrot, Series. 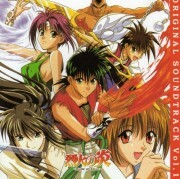 Recca Hanabishi is a 16 year old boy who has the ability to create fire in his hands, as he was destined to become a leader someday. His powers came from a 400 year old clan who he does not know anything about. 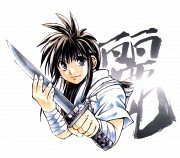 A year after his birth, Recca's father Ouka came into a conflict with Oda Nobunaga a powerful warlord seeking for the clan's Elemental Weapons. 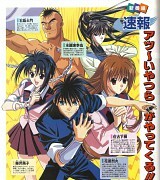 Due to this conflict Recca's mother Kagerou was forced to used a forbidden technique only to save Recca hoping that he would be safe. Recca being vulnerable to his own background was left clueless as to what is happening. Recca was followed by an old friend who he has connection to and he does not know anything about this enemy of his, and will he able to figure out his true purpose. The anime is well presented, although you will be a bit confused at the beginning but everything is slowly revealed as the story progresses.There's lots of humour in this anime because the good guys ( almost everyone are idiots ) . They just cant make things right. ( and yeah, i'm sure lots of people like the main lead get beaten up when he said something wrong about his girlfriend or getting fooled by others.) When it goes to the fighting part, it is fun to watch and somehow exciting as you will find a lot of diffrent moves. ( exclude the main lead ). when it comes to originality, this anime is lack of it. As i said it before, some fighting moves are copied from other animes. I really like the plot and the physic devices they use there wish I had one. If I did I'd like to possess the dark water, coz I really like any power related to cold. The character I like is Kuray(well that's how they pronounce it.) I like his costume it really suits his character, and his flame scarlett is beautiful, except that she's naked. I enjoyed this anime mostly because I like tournament stuff where they have to battle their way up. The dark tournament was exciting. The graphic throughout the series was inconsistent and it's a bit bothersome. Well, I do like this series, despite of the sudden changes of graphic in somewhere in the Tournament arc. It's hard for you to get serious while watching this anime, the characters made almost everything looks hilarious. It's all about fighting, romance and humor. My only advice is, DON'T WATCH THE DUBBED ONE. 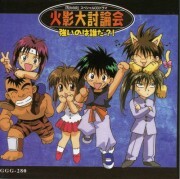 Recca no Honoo is one of the first few anime series I've ever watched as a kid, and it didn't fail to entertain me no matter how many times I've re-watched it. All characters' personalities become transparent as the story progresses, and they get to improve too through their battles and struggles. There's also humor for a segue in almost every episode. Anyhow, I liked it and appreciated the entertainment it has brought.